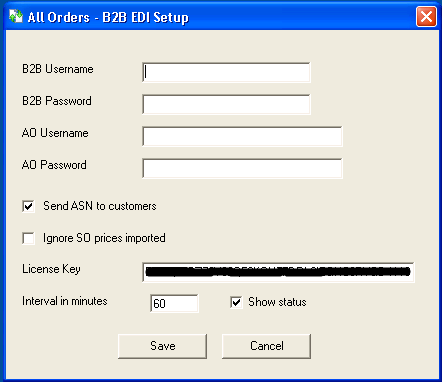 All Orders - B2B Gateway Connector is a utility software program the serves to integrate the EDI services of B2B Gateway and All Orders. This utility is installed on single computer and runs in attended or unattended mode. Before you can use All Orders - B2B Gateway Connector you need to establish an account with Shannon Systems. They will provide you with a username and password. You also need a license key from NumberCruncher. Login into your NumberCruncher account, click the 'Download Software' button then scroll down until you see it under 'Additional Downloads'. Click the hyperlink and save it to your computer. After the download is complete run the installer and follow the onscreen prompts. The installer will create an entry in Programs --> All Orders --> All Orders B2B Gateway Connector. AO Username and Password: Enter the username and password of the All Orders users that will be used to login. The user should have full access to All Orders and NOT be connected to QuickBooks. This user will not consume an All Orders license. Ignore SO prices imported: Check to override the prices on the 850 with the prices in All Orders. Interval: Indicate how often the connector should run to retrieve orders. Show status: Check to show a status window when the connector runs. Config.xml file: This file stores all the configuration date. EDI Files\Import: This folder is where the downloaded EDI files are stored BEFORE they are processed in All Orders. EDI Files\ImportArc: This folder is where the downloaded EDI files are stored AFTER they are processed in All Orders. EDIFiles\Export: This folder is used to keep EDI a copy of the files sent to B2B. The utility will run using its scheduled interval. At any time you can run, re-enter setup or exit the utility by right clicking on the icon in your task bar near the data and time. All Orders B2B Gateway Connector can also be configured to send and/or received EDI documents 944,943,940 and 945 used with a third party logistics company. Please contact NumberCruncher support for additional information.